*How far along? : 36 weeks. 9 months. yowza! *How big is your baby? : I don't even know. Big? Yes, he is definitely big. Picture a basketball in my stomach. That's how big he is. 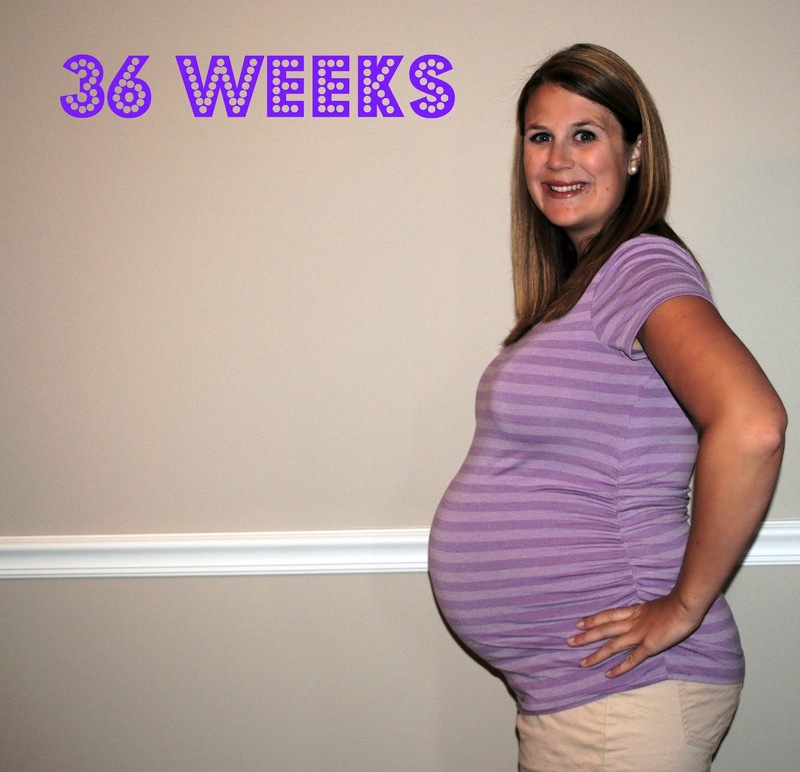 *Maternity clothes: I'm living in comfy clothes...workout shorts, Ben's tshirts, & tank tops. *Movement: Still moving A LOT but I'm sure it's getting pretty cramped in there. He has been getting in some crazy positions & making my stomach look lopsided. *Sleep:I've just come to terms with the fact that I will sleep when I'm dead. I am SO FLIPPING HOT at night. We keep our house at 67 degrees each night, the overhead fan is on, AND I have a fan blowing right beside me...still? I wake up sweating. *Symptoms: pressure, pressure, and more pressure. *Best moment this week: Got my new Baby K'Tan carrier & stocked up on some baby essentials today at Target. I'm starting to gather things for the hospital stay! *Food cravings: water & more water! *What I miss: sleeping comfortably. At least when I am waking up in 3 weeks it will be to feed & snuggle with a newborn! *What I'm looking forward to: my OB appointment on Thursday. I'm curious to see if I am pretty much closed for business down there like I was with Grayson. Getting closer! You look great! Can't wait for that little bundle of joy to get here... and hopefully in 20 years you can finally sleep!! You look great! Bummer that you're so hot at night. It's so hard to sleep when you're a million months pregnant! But it's almost over!! You look soooo good!!! Congrats on the only 22 lbs weight gain! That's awesome!! Wish I could have said the same for myself....woof!! SO CLOSE! G2 will be here so soon. You look wonderful - sorry you're so hot. :( Hope you get a little sleep before your sweet boy arrives. I can't believe it's so close!!!! So exciting!!!! You look great!!!! you look wonderful!!! I know you must be SO ready...esp in this crazy heat!! !